What was once an ornate movie palace from the golden age of cinema has been transformed by Cescaphe into one of the city’s most spectacular wedding destinations. Vaulted cathedral ceilings, chandeliers draped in pearls, antiqued brass hardware, classic columns, and a floor-to-ceiling bar create a sense of luxury in the grand style. 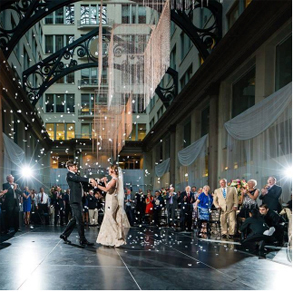 This magnificent setting makes every moment of your wedding—from the reception to the final dance by candlelight—an experience to be forever held in your hearts. 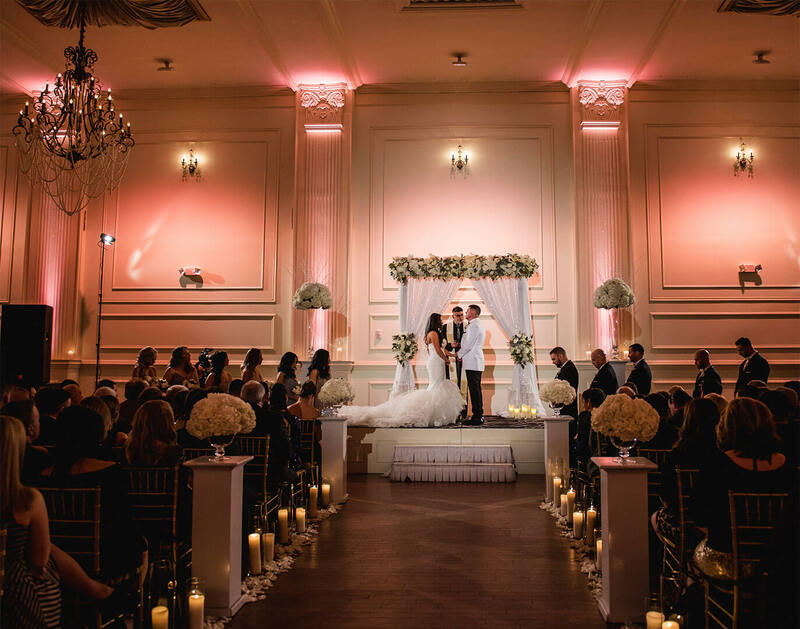 Cescaphe Ballroom is the perfect venue for a classically elegant ceremony with a candlelit stage creating a naturally romantic atmosphere. Guests will be thrilled as the Bride enters from the top of our grand staircase, and photographers will love the photo opportunities from the Juliet balconies. 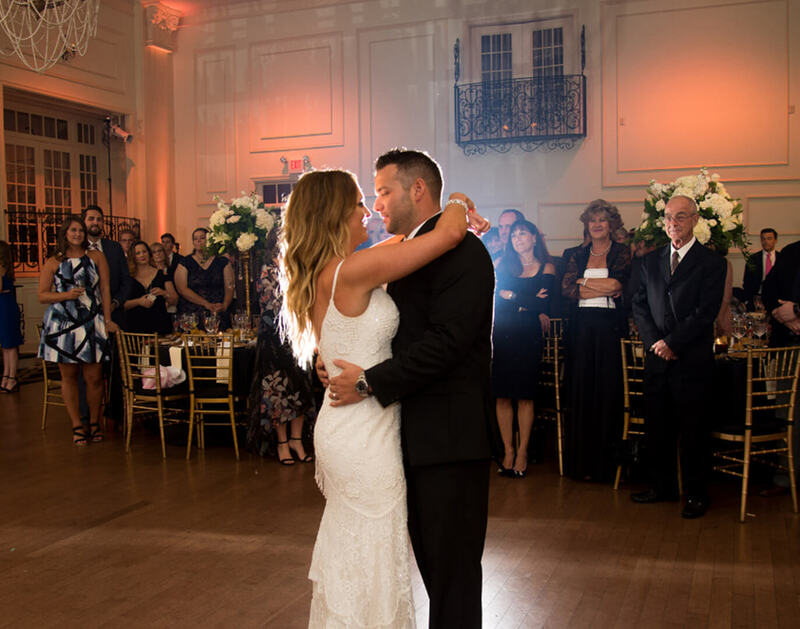 When you choose to host your ceremony at Cescaphe Ballroom, we will add an additional half hour to your six-hour affair. Cescaphe Ballroom weddings feature our signature cocktail hour-and-a-half, and offer three separate cocktail spaces: Garden Courtyard, Lounge, and Main Cocktail room. The Garden Courtyard serves as the entryway to Cescaphe, and your first cocktail space. The Lounge Area is used during the winter months. 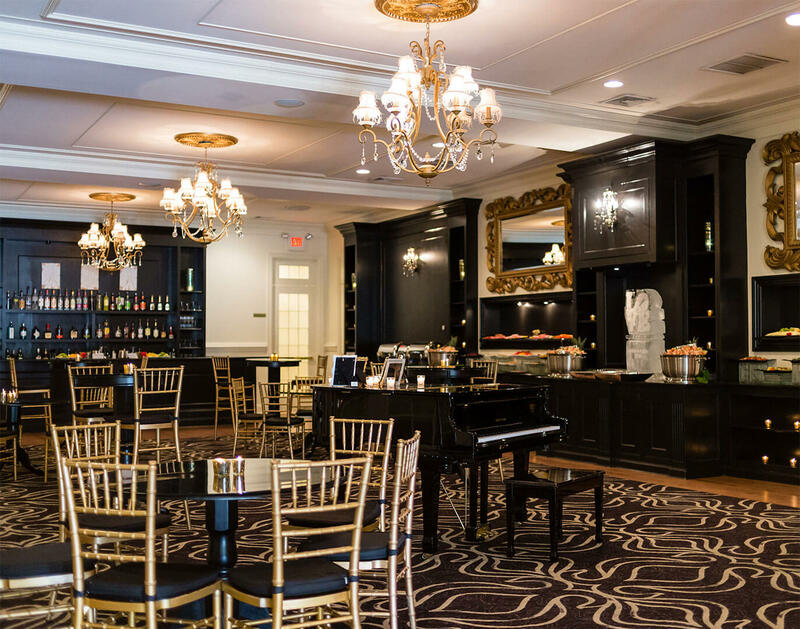 The Main Cocktail Room overlooks the Grand Ballroom from four balconies and holds a chef-attended action station and a forty-foot mahogany food library, featuring a customizable ice sculpture and famous raw bar, as well as a full-service bar and a baby grand player piano for soft background music. Cescaphe Ballroom receptions are hosted in the Grand Ballroom. 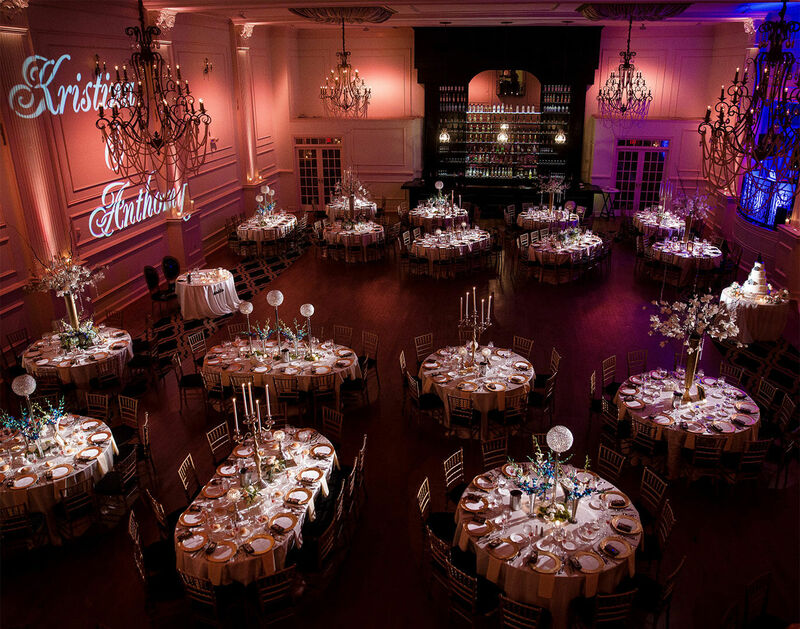 Cescaphe Ballroom exudes luxury with its vaulted cathedral ceilings, crystal accented chandeliers draped in pearls, antiqued brass hardware, hardwood flooring, and painted columns all adding a grand feel to the space. There are NO WORDS to describe how PERFECT our wedding was. We booked the Cescaphe Ballroom. From the first time we walked through the doors we knew this was the place for us. I am a wedding planner myself and my husband and his family own a catering company so the standards and expectations we had were very high. And Cescaphe exceeded every single one. From the tour, to the emails, the phone calls, their amazing vendors, the planners, and the day of staff they did not miss a beat. 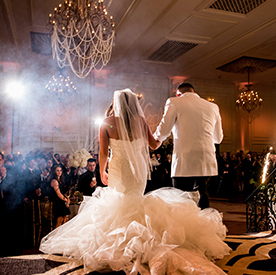 We felt like family and that is a feeling you need on the most important day of your life. The food was delicious and over the top, the staff was amazing and our Maître D was THE BEST in the business. Our Event Manager was so on her game and had an answer for all of my questions. She was there whenever I needed something along with the Maître D. My family couldn’t stop commenting on how accommodating the staff was. My guests were blown away by every single thing there. The shrimp, lobster, dinner, and yes, the chipped beef that I just had to have were all AMAZING. I mean I am truly speechless. This is a day we will remember forever. 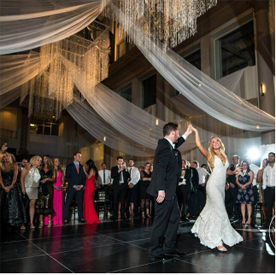 Hearing that your wedding was the best they have ever attended from multiple guests is all owed to Cescaphe and their amazing staff. They sure know what they are doing and are always up on the best trends. This was a dream come true fairy tale wedding and I wish I could do this all over again. Thank you, thank you, thank you!!!!!! We had our reception at Cescaphe Ballroom. Everything was amazing! The night went so smoothly. We received countless compliments on the food and the venue itself being beautiful. The entire staff goes above and beyond to make the night perfect. Our Maître D made sure we were able to see everything before our guests, that we always had a drink in our hands or food at our table. Our Event Manager made sure she was always available for questions leading up to our wedding day. I cannot think of a single complaint. You simply cannot beat Cescaphe! I had my reception at the Cescaphe Ballroom. Honestly, there aren’t any words that will truly do Cescaphe’s service justice. Their service is impeccable. Our Event Manager was exceptional. My entire wedding went off without a hitch. The Maître D was nothing short of perfect. The entire staff treated myself, my husband, and our families like royalty. They know every preemptive step to take to ensure everything is executed flawlessly without any hiccups. They fix problems before they even arise. They are so on point it’s insane. I’ll be honest, I was a little weary of choosing a Cescaphe venue because we’ve been to so many of their weddings for other couples, but they truly put a personal touch on every single wedding. They went above and beyond to make our wedding a one of a kind experience. They made the process easy, and their food is out of this world. They are simply the best. My daughter had her wedding at Cescaphe Ballroom. It was absolutely incredible thanks to the amazing staff. Our guests are still talking about how top of the line everything was. They are shocked when I tell them we did not have to upgrade a SINGLE thing. I keep hearing nightmares from other parents about cost of upgrades and last-minute cost increases. There is none of that here – costs are discussed up front and everything is included. The food and the venue are just amazing. Thank you!